Irish beanie features a dimensional green shamrock appliquéd on the front. This Irish beanie features a puffy shamrock, that measures 2" wide x 2" tall, appliquéd in a black field. 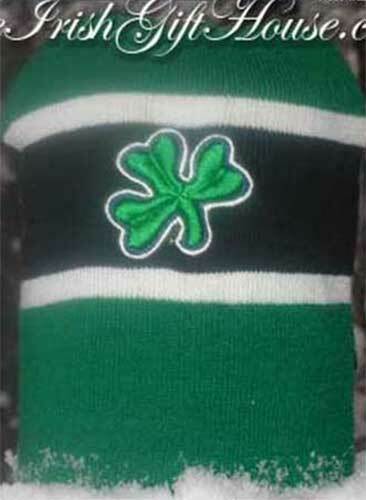 The green ski hat is further enhanced with two vertical white stripes along with blue and white outlines surrounding the shamrock. The embroidered shamrock beanie is a one size fits most design and it is made of acrylic. The Irish knit cap is received with a shamrock history card, complements of The Irish Gift House. Irish beanie ski hat features embroidered shamrocks along with the word Ireland. Irish beanie is a knit design that features white shamrocks on a green field. Irish ski cap is a knit navy blue design that features an embroidered green shamrock appliquéd on the front.